As part of a prestigious contract, Lakes Doors had been recommended to the Clients by The Cave Architecture and Design, Alderley Edge, Cheshire. 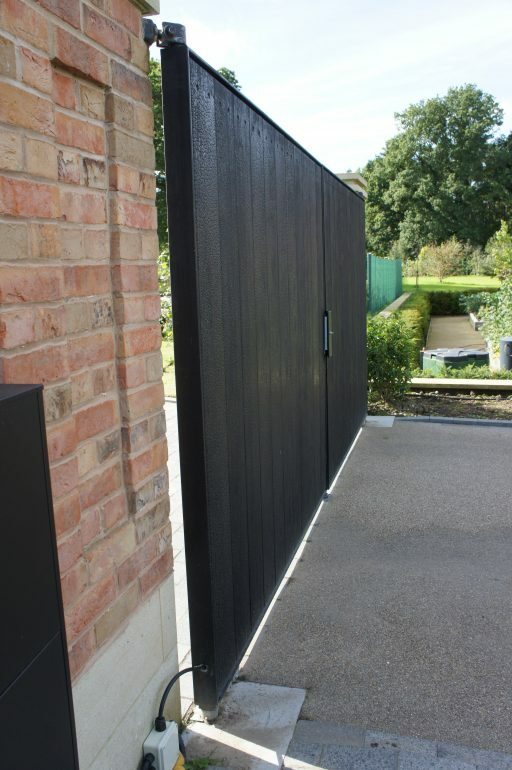 As a result, we were appointed to supply and install a pair of automated Shou Sugi Ban gates. These gates were to match the Shou Sugi Ban Front Door of the House, also to be supplied by us. Shou Sugi Ban is the a traditional Japanese Treatment of timber and involves protecting the timber by heavily scorching the surfaces. As with the Shou Sugi Ban front door, the timber sizes available from UK importers were limited and unsuitable for this project. So, we had no choice but to produce the wood for the Shou Sugi Ban gates ourselves. Producing the finish for the Shou Sugi Ban Gates. Several species of timber were tested. Eventually, Accoya engineered boards were decided upon. These are very durable, stable and remain so during and after the torching and scorching process. 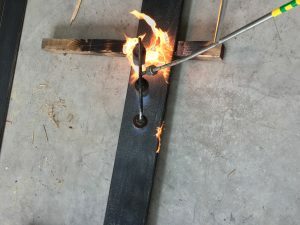 An industrial blowtorch was used to scorch the timber and a method was found to produce a beautiful effect. Various sealants were tested and one found which completely sealed the surface yet maintained the natural sheen of the charcoal. A sample was then produced for Client approval. The Clients were delighted with the result so we were then able to proceed with the remainder of the gate manufacture and installation. When you view the fully installed gates you can be forgiven for not being aware of the precision framework underground and inside the pillars. A large heavy gauge steel RSJ under the driveway connects two steel columns inside the brickwork pillars . Also attached to this galvanised framework are the underground foundation boxes which house the gate motors. Onto the steel columns are attached the top hinges. The motor pivot point acting as the bottom hinge. The main reason for this framework, which sits in concrete, is to support the very heavy gates. The brick pillars alone were not capable of this. Conduit for the electrity, control and communication cables, ran alongside the framework so ensuring that no unsightly wires were visible. The Clients chose a Videx GSM intercom system. The GSM unit at the gate has a SIM card, enabling the gate console to make telephone and text calls. The unit will call either a landline or a mobile phone and, after calling for a predetermined time, will divert to another number. This enables the homeowner to speak to the caller at the gate from anywhere in the world and the caller will not be aware. The GSM unit has numerous other desirable features. Safety is paramount with automatic gates. Devices designed to provide safety have to be considered and planned for. Regulations must be observed. The gates must be force tested, CE marked and a Declaration of Conformity issued to the Clients on completion. 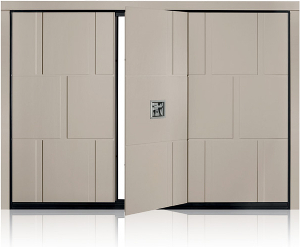 Lakes Doors only use the best equipment with built in obstacle detection, safety photo-cells and other devices as necessary. We are qualified and have the equipment to force test and issue the required certificates. The pillars were built around the steel posts and before the driveway was laid we hung the gates. All the wiring had been drawn through the conduits so final fixing of all the components, and installation of the motors was quickly carried out. We performed a test run on the gates that same day. Final commissioning and handover would take place at a later date when the driveway was completed and building work around the gates was complete. The main aspect of the commissioning is the settings on the gate control panel. Such things as the automatic closing, pause time on opening, gate travel speed and the force delivered by the motors. Some, such as the automatic closing and pause time, are decided by the Clients. Others such as the force and speed settings are dictated by safety testing. Setting up of the GSM intercom is done with a laptop on site. The clients telephone numbers are programmed in. Also, other telephone numbers may be programmed in to give an ‘open only command’. This allows any designated phone to open the gates by a telephone call. The gate console recognises the pre-programmed number, drops the call without answering, and opens the gate. In this way no call is charged for. Another feature of this installation is that we can access the gate control panel remotely. In the unlikely event of a problem, we can log in securely, download and analyse events. If necessary, we can make adjustments to the gate automation from the remote computer. The handover took place with the clients. They were shown the full workings of the gate and intercom and all safety features were explained. We prepared and issued to the Clients the Delaration of Conformity, the test certificates and all the instruction manuals. Finally the gates were CE marked.